O.K.E. 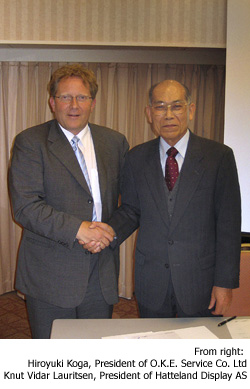 Service Co. Ltd has joined the Hatteland Display worldwide service network after signing a contract with the leading marine display and computer manufacturer on 10th April 2008, at Japan's principal maritime event, the Sea Japan exhibition in Tokyo. The agreement will see the well established marine service company performing both warranty and non-warranty service for all Hatteland Display products in Japan. Based in Yokohama, with service offices in Kobe, Shimonoseki, and Nagasaki, O.K.E. Service Co. Ltd has become a highly respected marine service provider, through its work with several large European marine electronics companies and systems integrators. This experience and an existing first hand knowledge of Hatteland Display's products, ensures that the company is already well positioned to become Hatteland Display's official Japanese service partner. "The agreement with O.K.E. improves our service network substantially and reflects the ongoing efforts to develop our business in the Far East and especially in Japan, following a record year in 2007," said Knut Vidar Lauritsen, President, Hatteland Display. "We already have experience of Hatteland Display's products as they form an integral part of many of the marine system integrator's solutions that we already work with, so this service agreement is a natural progression of this,"
comments Hiroyuki Koga, President of O.K.E. Service Co. Ltd.
"From this foundation, and through training and collaboration, we are confident that we will provide Hatteland Display customers with a high quality service." Hatteland Display manufactures high quality marine monitors and computers. Its products are used by system integrators and can be found on all vessel types, all over the world. The company prides itself on quality, and boasts multiple Type Approvals across all of its products. Hatteland Display was purchased by Ferd Private Equity Fund II on 27 March 2007. O.K.E. Service Co. Ltd is a leading Japanese field service company covering installation, supervision, maintenance, repair, inspection, sales and service of a wide range of marine electronics products. The company also carries out installation, maintenance and inspection of level meters for LNG plants and tankers in addition to being involved in the marine construction sector. It is a member of Ship's Electric Installation Construction Association of Japan, ZKK (Zenkoku Musen Kouji Jyujisha Kyoukai) and the Yokohama Chamber of Commerce.